In this second article of the series I want to consider the how to get MailChimp ready for the integration. 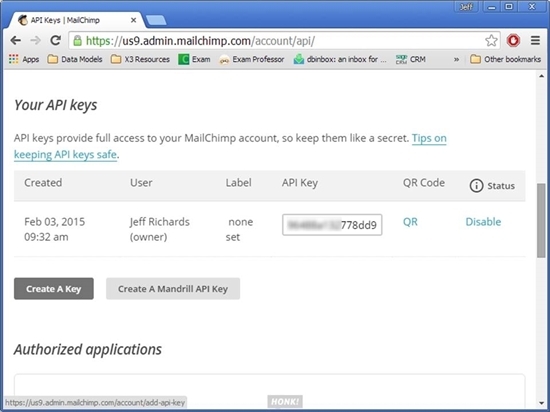 This will include how to generate the API keys and identify the mail list to which Sage CRM will send contact details - these will become MailChimp list subscribers. You will need to have a MailChimp account (and a list) already created. Assuming that you have that, you next need to logon and click to open the admin menu. The API Keys are found under the 'Extras' menu option. Scroll down the page until you see the 'Create A Key' option. Click this and you will have 'birthed a bouncing baby API key'. You will need to copy this to a text file until you are ready to use it in Sage CRM. The next thing you have to do is create a Mail List. Click the top left menu which should produce this familiar screen. Find the list that you want and click the lists drop down menu. Choose settings and scroll down to find the List ID. This is in small text and could be easily overlooked. Copy the list ID in to a test file until you are ready to use it in Sage CRM. The next article will cover exactly that, how to use the API Key and List ID to configure the integration with Sage CRM.